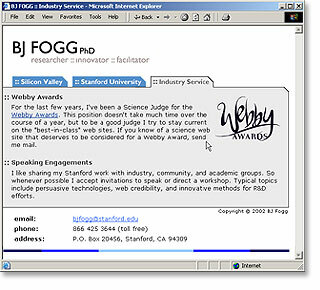 Purpose: To revamp the personal website for BJ Fogg. The project focused on creating a more professional looking site using all existing content from the original site. Description: The site was developed in two weeks and explored two primary directions. The current implementation and another prototype. The site is also designed using modular tables so that the owner can easily update the content.